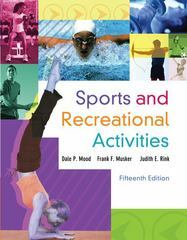 Sports and Recreational Activities 15 Edition Designed for teachers, future teachers, and participants, this comprehensive text provides fundamental information on 40 different sports and recreational activities. The text prepares you for the playing field and gym by covering teaching considerations, techniques, lead-up games, drill activities, and information on teaching special populations. Also included is an overview of all aspects of each sport, including history, equipment, fundamental skills, rules, strategy, etiquette, and more. Hundreds of photos and drawings make it easy to grasp the skills and rules of each sport.